The FLAMELESS CANDLES use REAL WAX Candle Holders are decorative crafts in your living/Dining room. Designed to replicate the look of traditional pillar candles, this chic and long-lasting candle set will enhance any interior and looks just as good as the real thing.RELAXING FLAME FLICKERS softly and gently, just like a real candle, creating a soothing and relaxing environment. If the flame doesn't move after you press "light" button, press + to increase brightness to maximum. FLICKERING FLAMELESS CANDLES:Real Drip Pillar Wax CANDLES with REALISTIC FLICKER and the flame,give you a REALISTIC APPEARANCE without the smoke,fake scent or messy dripping wax! ARE YOU PLANNING A PARTY OR WEDDING? You will love this set of 3 Battery Operated Flameless Candles...Just set them into your favorite lantern, chandelier, sconce or candle holder or mix with other decorations. SAFE TO USE: 100% SAFE! Enjoy all the benefits of traditional candles and none of the negatives! We care about your safety, and a risk of fire shouldn't be a concern. No more dripping-hot wax, no more smoke or worry about falling asleep without blowing out the candles. Please NOTE: Since they are made with real wax they may melt in some conditions. EASY & CONVENIENT OPERATION: With One REMOTE CONTROL, You Could Control Flameless Candles of Different Sizes and Our Sets of 4"5"6" Flameless Candles.Once the timer is set, the candle comes on at the same time each day Timer feature allows you to set 2H | 4H | 6H | 8H, timed to automatically turn on and off. 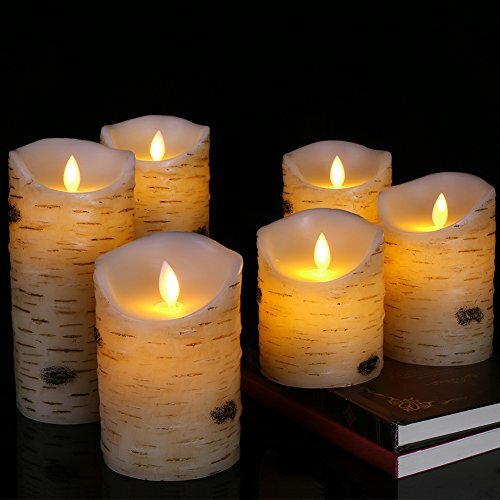 PACKAGE INCLUED:SIX LED CANDLES(4 inches,2*5 inches,6 inches,7 inches,8 inches). A REMOTE CONTROL and an operating manual.This product does require 2 AA batteries for each candle. Batteries are not included. Plus LED CANDLES Offers a 2 Year Guarantee!